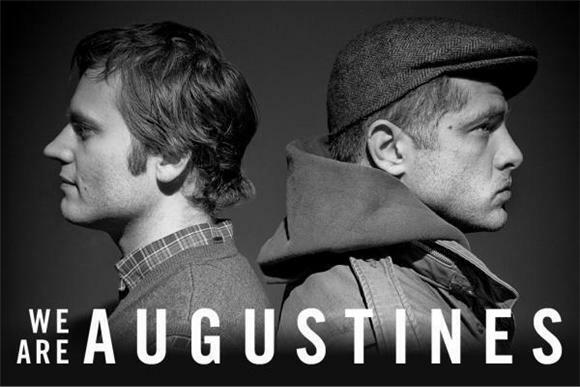 Following the split of their band Pela, Billy McCarthy and Eric Sanderson have regrouped under the title We Are Augustines. The songs for the debut album of this reconfigured duo are the surviving pieces of what was once a Pela creation. After some scenery changes and writing sessions with producer Dave Newfeld (known for his Broken Social Scene work), the formation of Rise Ye Sunken Ships saw some tangible development. The full album will be available this coming summer, and today the band is debuting the music video for the track "Chapel Song" exclusively here on Baeble! Now, the date for this release is no coincidence; this video premiere for "Chapel Song" is the perfect way to kick off Valentines Day. Even if you dislike the idea of Valentines Day, surely you are a fan of love, right? Or at the very least, kissing? Both are visibly present in this music video, which takes on the statement-making vibe of powerful sweetness. Although, there is actually more to the "Chapel Song" video than initially meets the eye. Despite the romantically striking visuals, the song itself lyrically explores the bittersweet process of letting go. We Are Augustines stroll down the blissful oblivion of love-struck lane, yet their focused forward movements reflect the truthful intensity of lyrics that express an internal breakdown amidst what is meant to be a happy event. Says director Matthew C. Mills: "The basic concept of this music video is one that I've been kicking around for a few years. I'm not sure where the imagery came from or how it got stuck in my mind, but I haven't been able to shake it. The idea of couples kissing is so simple and romantic. The very first time I heard 'Chapel Song' by We Are Augustines, I knew it was the perfect tune for this little lovefest of a video." Adds Sanderson: "On the day of the shoot everything went incredibly well. The weather let up for the day and a spring feeling was certainly in the air. Everyone that came down for the shoot was amazing. A lot of the decisions were made on the spot and nothing was really forced. I think my favorite part of the video is how the sun comes out right when Billy sings "tear up the photograph cause it's a bright blue sky". That was totally unplanned and so perfect. That really shows the kind of project this was." Shot with available sunlight. No electric lights or flex-fills used. 19 stops/starts. 3 useable takes.